When I watch Baseball games on TV, I have trouble to identify the pitch that the pitchers are throwing. I know the pitch types but can't tell the difference of a fastball to a slider when watching games on TV. I usually play baseball video-games, and I can easily identify the pitches when playing. I can tell if it is a slider, fastball, change-up and so on, but I have trouble when watching television. it's also possible sometimes to tell from arm position and angle but most professionals (even those on the bench) are good enough to make every pitch look the same in terms of release angles. However, sometimes when a pitcher loses his feel and the mechanics start to break down. So watch the pitcher, and listen to the scouting report. He probably only has 3-4 pitches he throws as a starter, and 2-3 as a reliever. Normally it will be a choice of Fastball, Slider, Cutter, Splitter, Sinker or a Knuckleball. There are more but these are rare. Fastball - Very little break. Fast. Pretty easy to tell when someone throws a fastball. Slider - This is slower than a fastball but with a similar release, Small to Med break. The best will break sharply and late, they will have a drop as well as a slide to them. Hanging sliders will look like a slower fastball with very little and often early to mid break. 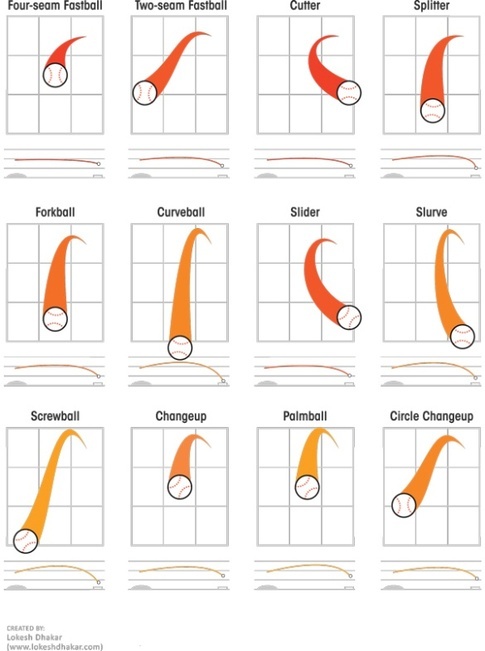 Sliders are common pitches(Randy Johnson had a pretty famous one) and sort of like faster curveballs, but are easy to "hang" by the pitcher, where the at the wrong velocity, can just sit up for the batter to crush. Cutter - Will maintain horizontal plane and cut away from a right-handed batter, sometimes picking up velocity. Very few pitchers can throw this pitch well, which is why Mariano Rivera's career is so remarkable. Sinker - This is a kind of pitch that is in-between a fastball and a split-finger fasterball. It is meant to be a fast pitch that "drives down" very hard as it approaches the plate. It's popular because sinkers increase the likelihood that a batter, on contact, will drive the ball into the ground, and ground-ball pitchers are less likely to be scored on. Knuckleball - Most obvious pitch of all. Tumbles instead of rotates, goes about 50-70 mph, and normally pitchers dedicated to it are the only ones to throw it. Tim Wakefield is famous for this. You're not alone; sometimes even the commentators, who have the same "over-the-shoulder" long-lens view that the folks at home do, will simply refer to a pitch as a "breaking ball" if it drops sharply or curves outside, even though a number of specific pitches can do that. The fundamental theory of pitching is that the batter gains an advantage over the pitcher proportional to his ability to predict the pitcher's next move, and conversely, the pitcher gains an advantage over the batter inversely proportional to the batter's ability to predict the next pitch. Your better pitchers have a number of weapons to accomplish this, but key to all of them is control over three elements of the pitch; speed (and thus timing), vertical axis (drop), and horizontal axis (slide). The variation of speed and breaking action produces a host of possibilities, which a good battery can use to keep the batter guessing. A pitcher can also aim pitches differently to make them look like other pitches; a pitcher can throw a fastball high and fool the batter into thinking it was going to be a sinker or splitter, or can throw a two-seam wide and the batter may think it's an errant four-seam until it breaks back over the plate. Batters like a variety of different pitches; exactly what the batter likes should be known by the pitcher and/or catcher, and a combination of what the batter flat doesn't like, and pitches that look like what he does like but then change, are generally the order of the day. From time to time a pitcher may give a batter exactly what he wants, hopefully when he's least expecting it; this is often necessary to avoid showing the batter the same pitch too many times, and a missed opportunity can also put the batter "on the tilt", throwing off their concentration as they mentally kick themselves. Not the answer you're looking for? Browse other questions tagged baseball media pitching or ask your own question.